This pair of vintage Philippines hand painted carved wooden wedge mules sandal shoes date from the 1940s. They are made of a hand painted carved wood, with a cut out tropical hut, palm tree heel and hand beaded blue fabric across the instep front vamp. These stunning sandal shoes have a backless mule slip on slipper style, open toes, a platform front and wedge heels. 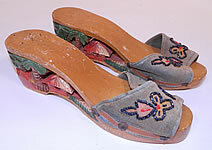 After the war, American GIs returned home from the Philippines with these shoes as gifts for their girlfriends and wives. 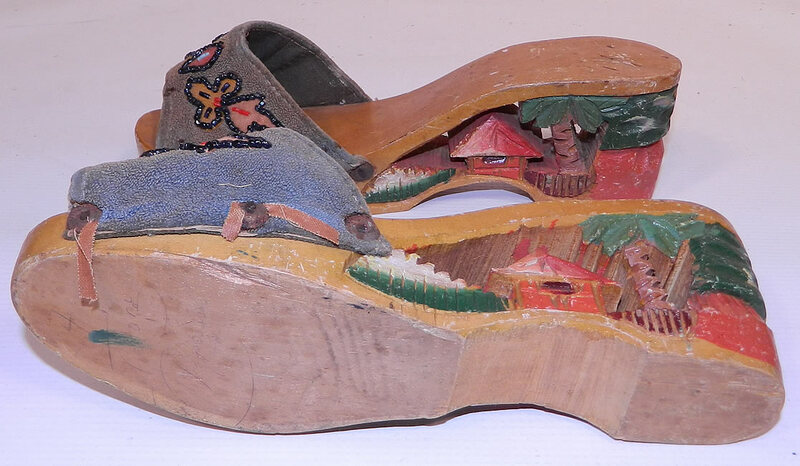 Each “souvenir shoe” contained a miniature scene inside its wooden heel. The shoes measure 8 1/2 inches long, 2 1/2 inches wide and have a 2 1/2 inch high heel. They are in good condition, with some wear, dings and nicks on the wood and the trim edging along the fabric vamp sides is frayed and loose. These would make a great display piece and are truly a wonderful piece of hand crafted wearable retro shoe art!